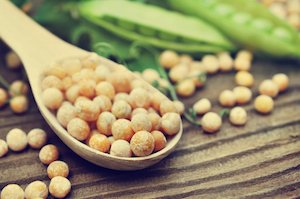 Pea protein is a versatile ingredient with some key benefits for natural food products. Suitable for vegans and vegetarians, this plant-based protein has a natural earthy flavor profile that fits well within a variety of food and beverage product recipes including plant-based protein drink powders, nut milks, non-dairy buttery spreads, nutrition bars and more. How is Pea Protein Made? Pea protein is most commonly presented in a powder form. Made from yellow split peas, the powder is created by extracting the soluble protein portion of the pea itself. The method utilized is usually done via cold-process to ensure that it retains the highest value of protein content while maintaining one of its core benefits, which is high digestibility. How Much Protein is in Pea Protein? The protein content of Pea protein is around 80%, which is quite high for a plant-based protein. It also contains a high amount of branched-chain amino acids (BCAAs) which can help with sustained muscle building, longer periods of appetite satiety, and prolonged energy throughout the day. Pea protein can also be combined with other plant-based proteins to create a higher protein profile if desired. What are the Benefits of Using Pea Protein as an Ingredient? Pea protein ranks low on the allergen spectrum as pea allergies are quite rare. It is easily digestible, which not only helps with absorbency but can also be ideal for individuals who are sensitive to dairy-based proteins. Studies have shown that Pea protein also leaves a majority of consumers feeling less bloated. High-quality Pea proteins are generally gluten free, dairy and lactose-free, low in carbohydrates, and vegan-friendly. As an added bonus, there are studies to support the heart health, kidney, and blood sugar regulating benefits of Pea protein [source: Dr.Axe.com]. How Can I Use Pea Protein in Product or Recipe? Pea protein can be used as an ingredient in non-dairy products such as plant-based cheeses, yogurts, and nut milks. Aside from food sensitive and allergen-free focused foods, this specialty protein could absolutely be considered for any product that needs added protein boost to round out the amino nutrition profile.